OpenCart Multi-Vendor Marketplace is an online marketplace & extension to support OpenCart stores and the Community. Hence this module provides store owners to multiply his/her own online business. So even If you are a solo entrepreneur in the online business world this module is definitely for you to extend your business to the next level. 1. Allows store admin to manage each product that associates to a third party merchant where third party vendors offer their products for sale. 2. The Buyers purchase products from multiple vendors on the same platform. 3. The Store Admin generates and earns revenue/commission from the merchant. The module is integrated with an email system to trigger the email to the merchant when respective products are purchased by a customer. This Module also has an Email and Notification Option so Admin can customize Email Message according to his needs. TMD Multi-Vendor is tailored for your business needs. 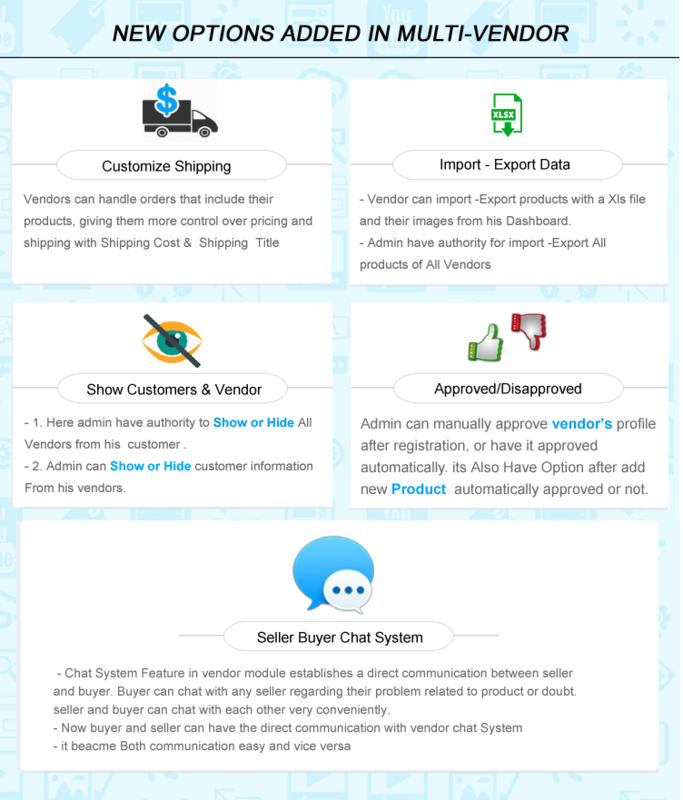 TMD Multi-vendor online marketplace is provided with his or her own Dashboard, and from there Seller can manage all attributes such as Downloads, Manufacturers, Products, Reviews, Recurring, and other options. A Seller can also change his or her profile information from here. It is compatible with various versions of the standard Opencart module. It is also a fully customized module with easy to understand features for scalability and best user experience. TMD Multi-Vendor Multi-Seller Marketplace is Designed to match your Marketplace as like Amazon & eBay. It builds your sellers, your buyers, and your marketplace.